Edward Quirinus Wagner (1855-1922) was born in Bittburg, Germany and emigrated to Detroit with his parents in 1865. 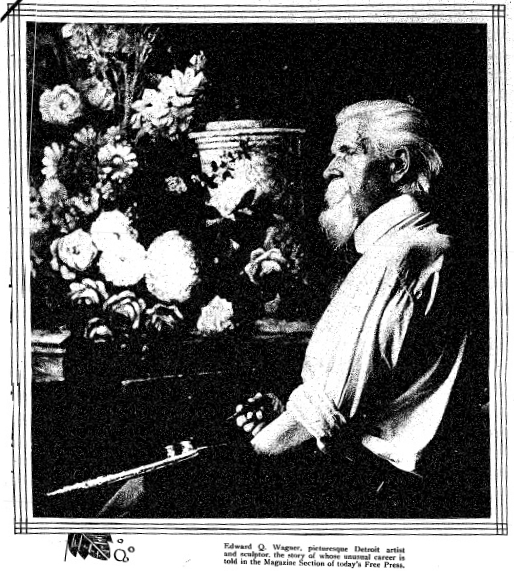 At the age of fifteen, he was apprenticed to Julius Melchers, and later worked in New York and Grand Rapids before returning to Detroit. Primarily a sculptor of stone, Wagner was a partner in Wagner & Reuther from 1885-1887, and Wagner & Vollbracht from 1890-1895. Wagner exhibited architectural sculpture in the Chicago World’s Columbian Exposition 1893 and did much of the sculptural work on the fair buildings for the Louisiana Purchase Exposition (St. Louis Fair) in 1904. He also spent five years in Rio de Janeiro working on sculptures for Brazilian government buildings. Wagner died in the German Protestant Home in Detroit and is buried in Woodmere Cemetery. The Parducci Society is a 501c3 organization of architectural enthusiasts dedicated to studying and sharing their love of architectural ornamentation and craft.